The most recognizable signs of a leaking pond are rapid water level decreases or the water falling below the level expected with normal use. Wet spots and aquatic vegetation (like cattails) below the dam may be good indicators of seepage through the dam or around the drain pipe and may help determine the location of the leak. Understanding why ponds leak and determining the most likely cause of the leak in your pond is the first step toward a solution. Leaks in ponds usually occur because of problems in one of the following areas. Topography, drainage area and soil content are the keys to making a good site selection. The pond should be located in an area with a watershed ratio between 10:1 and 15:1 (10 to 15 acres of watershed per acre of impounded water). Watershed ratios within this range will contribute an adequate amount of water to the pond without jeopardizing the structural integrity of the dam and spillway. 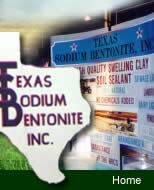 Soils should contain a minimum of 20 percent clay for good compacting, which prevents excess seepage. Areas containing large rock outcroppings are generally poor pond sites, because seepage often occurs through cracks or fractures in the rock. Good pond construction is essential for preventing excess seepage. 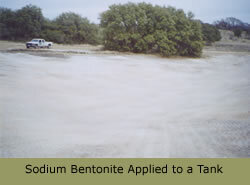 If the pond basin contains coarse-grained soil, a blanket of less permeable material (high clay content) may be necessary to prevent excess seepage. Trees and roots should be removed from the area of the dam to prevent seepage from root decay. A core trench should be excavated and backfilled with the most impervious material available at the site to prevent seepage under the dam. Once the core trench is complete, the most impervious soil remaining should be used on the water side of the dam. Anti-seep collars should be installed on spillway and livestock watering pipes. The dam must be wide enough at the top (10 t o12 feet for most ponds) to maintain structural integrity. The upstream side of the dam should have a slope that is not steeper than 3 to 1 and should be protected from wave erosion with grass or a rock blanket. The dam should be high enough to divert water through the emergency spillway and to prevent heavy storm runoff from overtopping the structure. Maintenance is necessary to keep a pond in good working condition. 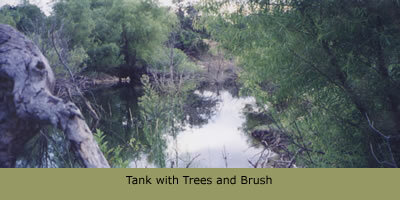 The dam (front and back) should be kept free of trees and large shrubs, because of decaying root systems can cause leaks. The spillway, outlet pipes and livestock watering pipes should be kept free of obstructions to prevent erosion damage. Keep brush, debris and aquatic vegetation cleared away from the dam to discourage animals from burrowing into the dam, which can cause leaks. Check the dam for wave erosion scars, grass may need to be planted or rock added to prevent further damage. Drought years may also cause problems. When rainfall is below normal and the water level falls, exposed soil can dry and crack, causing leaks in the clay blanket that protects the pond basin.